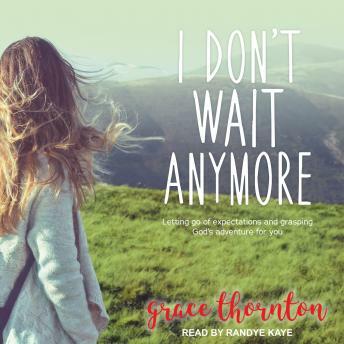 In I Don't Wait Anymore, Grace Thornton challenges listeners to find their calling and purpose from God and go after it with completely committed hearts. Have you been waiting for life to turn out the way you expected? You're not alone. There are lots of us out there who feel that way. Grace Thornton is one. She had dreams, plans, and ideas for what life should look like. For one, she thought she'd be married. She thought she'd have kids. She thought God would bring her the life she'd been waiting for because she knew He was good and she tried to be obedient. But that's not what happened. Not at all. So she found herself wrestling with God. Who is He if He doesn't bring along the life, husband, and 2.5 kids she thought He was supposed to? And where should she go from there? When she got brutally honest with herself and asked the hard question, 'Why do I think the world has more to offer than God does?' the answer was stunning. Her honesty led to the path God had for her. One that would write a story for her life that was even better than the one she had dreamed for herself. This positive and encouraging book offers inspiration to anyone who wants to live a fulfilling life right now.